2008 is here (I say that as if it were news) and I must say that I am excited about the year ahead. I have never really been one for setting resolutions but that is most likely attributed to my age. There is a certain instability of life that comes with being 24 years old – odds are I will be doing something completely different (career, personal hobbies, etc.) in 6 months from what I do now. 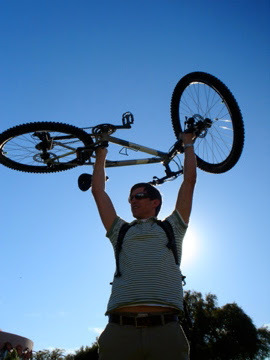 However, I see a lot of exciting things ahead of me this year, and bike commuting is at the top of that list. I have only been bike commuting since August 2007, but have biked an average 4 work days out of 5 for those past 5 months. I have been able to continue riding into winter since I live in Arizona – we’ve had a couple mornings in the upper 30s so far, but it could certainly be much worse. 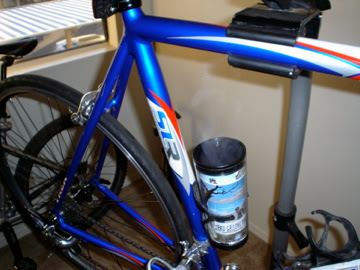 After reading Jack’s post I set up an account at bikejournal.com; hopefully I can keep up with my mileage numbers. I don’t know the exact breakdown, but the cyclometer on my road bike has 3276 registered miles and it just turned 2 years old – meaning I am averaging ~1600 miles per year. In addition, my mountain bike shows 704 miles on the cyclometer (I have only had it since June), giving me a total of ~4000 miles biked in the past two years. I would say that I rode more miles this past year than the former, and assume the breakdown is more like 1800/2200. Based on how much I have been riding and what I predict to ride this year, I want to shoot for 2500 miles ridden in 2008 (this is a GOAL, not a resolution). I head back to work tomorrow after being on vacation since Dec. 21. Our forecast for tomorrow shows sun with 46 degrees in the morning and 69 degrees by the afternoon. 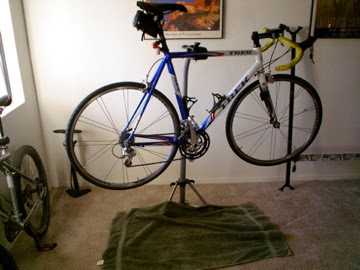 This has me so excited about getting on the saddle tomorrow morning as I head to the office. And what better way to spend New Years Day than getting my bike ready to go?! It is a bit chilly outside today but the winds are howling around 20 mph sustained, so it just feels right to stay inside, wearing my new fluffy slippers, and wrenching and scrubbing around on my aluminum steed. After brewing a fresh pot of coffee, I got to work and scrubbed off all the dirt and grime from my wheels, frame, drive-train, etc. I made sure my shift- and brake-cables were properly tightened and adjusted; made sure the chain and derailleurs were grit-free and properly lubed; sipped on my java and rocked out to some Nickel Creek. The Velorution is coming at you 2008 – I have a feeling it will be a good year! May all of you have a safe and Velo-rific year. Happy Riding! Have a Velo-rific New Year, Jeff and everyone else!